DivX format is widely used nowadays as an easy alternative for DVD and MPG video formats. DivX files are almost same in quality as DVD and MPG files, but small. This is one of the main reasons for choosing DivX as an ideal format for mobile device players. DivX uses an encoding technology that is almost similar to AVI. I hope you know that AVI files are used by SmartMovie converter and SmartMovie player, which are paid software. So if you can encode your mobile video files to DivX, you can use DivX mobile player to play these files in same as quality as SmartMovie player and without paying any money. You can play all types of DivX media files DivX mobile player. Record and save mobile videos as DivX videos. It automatically scans for DivX files on mobile phone and lists. 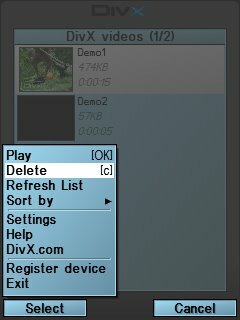 Play DivX files on TV using mobile devices with TV connectivity. Download DivX videos from the internet. DivX player supports mobile OS versions Windows mobile 6, Symbian S60, Symbian OS UIQ. Download DivX Mobile player here. The videos should be first converted into DivX mobile formats, before they are transferred to mobile device. Check out this article to get full version serial of DivX 7 pro with converter. ed : Download SmartMovie Player .